David: I think this is your something big. I would love to forget about this whole thing. I would love to forget I ever met Wendy. I would love to forget I ever met you. But now, I need you. Because I'd be really terrible at prison. That's if I'm lucky enough to live that long. Olivia: You're not just here for you. I know you David. This is about justice. This is about dusting off the white hat and putting it back where it belongs. 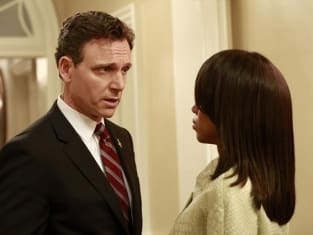 Scandal Season 2 Episode 14: "Whiskey Tango Foxtrot"
What do you think she wanted from me? That we faked the moon landing? That a Starbucks tall is really a small? She wanted Defiance, Liv. Fitz: Cyrus, you're in my bathroom. Cyrus: Yes, sir, Mr. President, and I'm as unhappy about that as you are. Scandal Round Table: "Whiskey Tango Foxtrot"
Scandal Review: Who Can You Trust?